Volcanic eruptions are dangerous and hard to image. To learn about their fluid dynamics we often have to develop methods to understand the dynamics from the deposits left after an eruption. In the blog post below, one of our graduate students, Mary Benage, describes techniques she developed to better understand the dynamics of pyroclastic density currents in Ecuador. 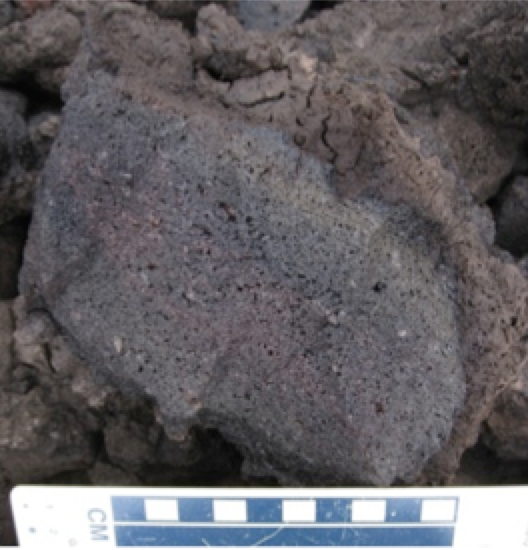 At both Tungurahua and Cotopaxi volcanoes in Ecuador, there are unique pyroclasts (volcanology term for a rock formed from fragmented magma ejected out of a volcano) called breadcrust or cauliflower bombs. The reason for the name is the rocks have a breadcrusted appearance or a foamy appearance that resembles bread or cauliflower, respectively. Breadcrust bombs have a dense surface, called a rind. The rind is denser and has fewer bubbles than the interior of the rock (rind – low vesicularity, interior – high vesicularity). Breadcrust bombs range in composition and are generally tied to an eruption style called Vulcanian. There has been research on the texture and composition of breadcrust bombs (e.g. Wright et al., 2007, Giachetti et al., 2010) but previously there has not been a numerical model to examine how these bombs might form and what are the controlling factors in the formation of the crusted exterior of these volcanic rocks. We hypothesized that the thermal history of these breadcrust bombs plays a role in the rind thickness and morphology of the bombs. To test this hypothesis we developed a 3-part numerical model composed of (1) a macro-scale multiphase Eulerian-Eulerian-Lagrangian (EEL) model, (2) a clast-scale thermal and viscosity model, and (3) micro scale-bubble growth model. To test how the thermal history can affect the rind thickness, in the model we compare two end members of transport for a pyroclast: transport as a ballistic (parabolic trajectory out of the volcano) and transport in a pyroclastic density current (pyroclastic flow) with varying gas temperatures. The macro-scale model is a complex fluid dynamics model that models the propagation and interaction of particles and gas (the two components that make up the pyroclastic density currents (PDCs) that flow down a volcano during eruption) as continuous phases, as a fluid. The two continua phases are solved using the conservation equations and many other constitutive equations (equations that tie the continua phases together and complete the conservation equations for the specific gas and particle phases). These two phases make up the Eulerian-Eulerian component of the model. The Lagrangian approach allows individual, larger pyroclasts to be tracked throughout the current. The Lagrangian approach is one-way coupled to the fluid phases. Through the Lagrangian component we can track pyroclasts through their transport regime (projectile pyroclast or pdc pyroclast) and thus the thermal history of the particle. The tracked environment of the particle is used in the clast-scale model that solves a one-dimensional heat equation (we are assuming the rocks are perfect spheres) coupled to a viscosity model. The viscosity model we use is from Giordano et al. (2008) that developed a model of magma viscosity from experiments on magma of varying composition, dissolved water concentration, and temperature. This is the part of the model where the cooling of the pyroclast is calculated and this depends on the path of the pyroclast such as its velocity or surrounding temperature. 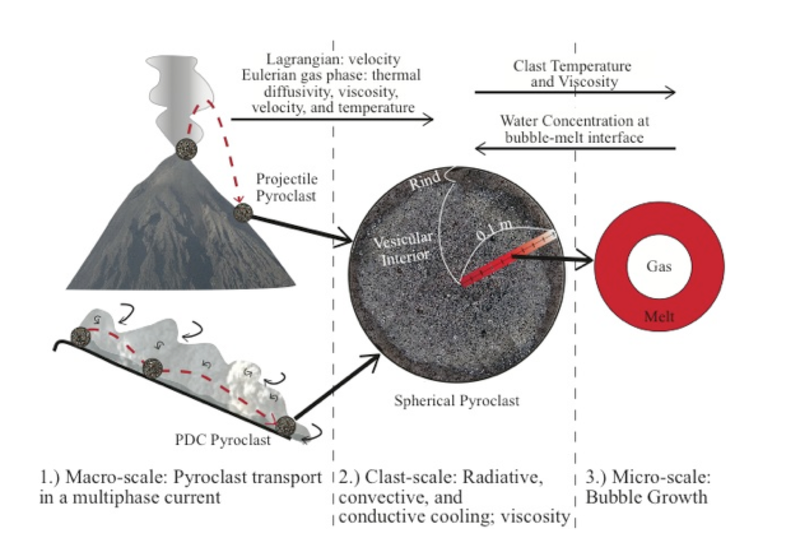 The third component of the model is the micro-scale bubble growth model that is dependent on the pyroclast composition, amount of dissolved water, temperature, and viscosity. 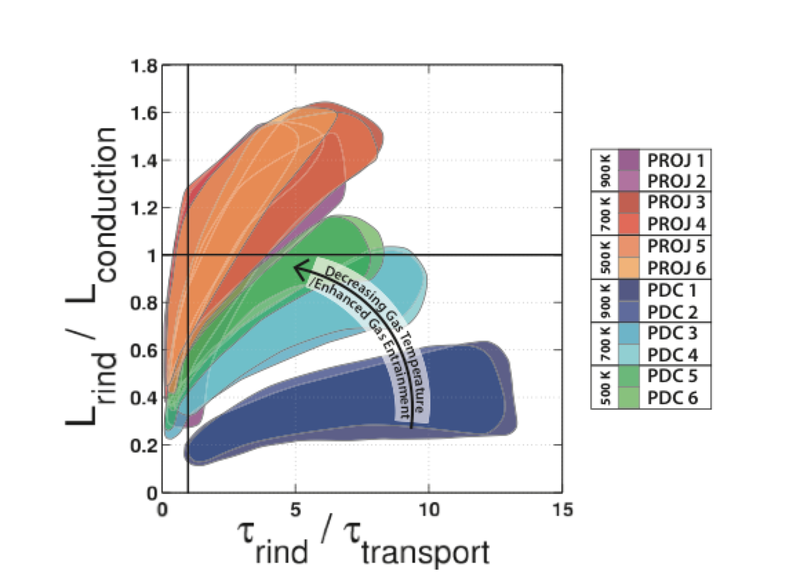 We modify the bubble growth model of Proussevitch et al. (1993) for this part of the model. This component is crucial as it allows the model to quantify rind thickness, which is established as the radial component with the smallest bubbles. 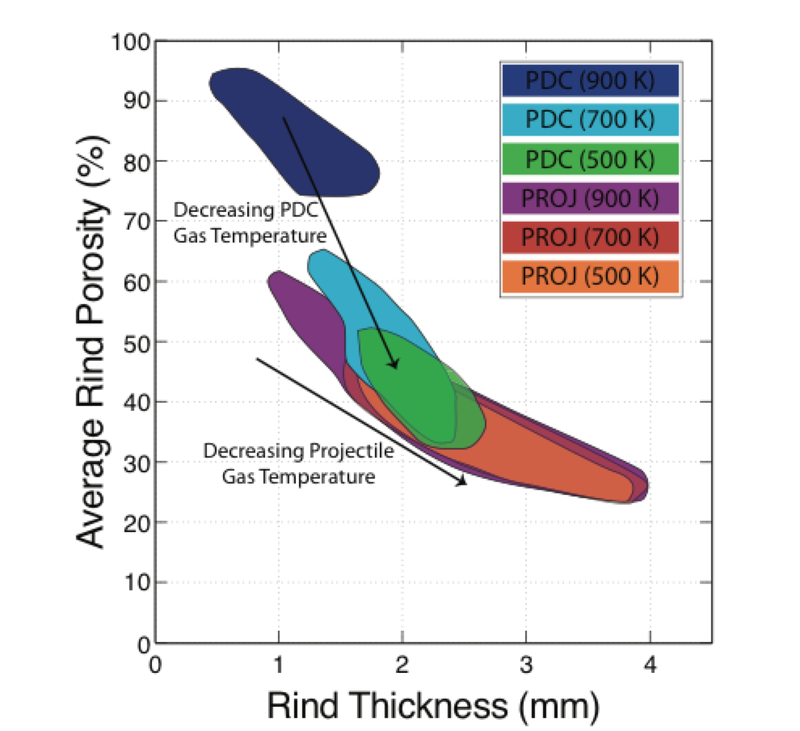 Through this 3-component model, we track and calculate how the transport (projectile pyroclast versus a pyroclast entrained in a pyroclastic density current) and thermal history of a pyroclast affects the temperature, viscosity, bubble size, and bubble growth rate that results in varying rind thicknesses. A clast that cools quickly has an increase in viscosity that slows or freezes bubble growth and a low-vesicularity rind is formed. If the clast stays relatively hot (its thermal environment is hot), then the bubbles are not restricted and grow to their a priori final size (numerically for the bubble growth model there is a calculated final bubble size). Through the model we determine the timescales of cooling and bubble growth are important in the formation of the rind. The morphology or lack of bubbles found in these breadcrust bombs can provide information about the cooling history or transport of these clasts. Our results show that not only does initial dissolved water content control rind thickness (which has already been shown through texture and chemical analyses) but also that the transport regime and surrounding environment (e.g. temperature) play a role in the rind thickness of these clast. The results of the model informs us that we need to examine breadcrust bombs more carefully as they may provide critical information about an eruption. We believe understanding the formation of these bombs can provide information about pre-eruptive conditions as well as transport history. There is still a lot of work to be done but the model suggests there is still more information these peculiar clasts hold about an eruption and the currents generated by the eruption. Further work will be mapping out these breadcrust bombs and analyzing their textures in detail at other locations. We are currently applying this model to the deposits from the 2006 eruption of Tungurahua volcano in Ecuador. We will use the model to understand the cooling history and pyroclastic density dynamics of the eruption. Mary is currently in the fifth year of her PhD at Georgia Institute of Technology and is planning to defend her dissertation thesis in the next 6 months. Mary knew from a young age she wanted to study volcanoes. This was a result of growing up on the Bandelier Tuff, living in the nerdy town of Los Alamos, NM where everyone has a PhD, and having a desire to study science while being outdoors. Mary attended Mesa State College in Grand Junction, CO and majored in Geology and minored in Mathematics. She also participated in an NSF-REU program, attended geology field camp in Ireland, geophysics field camp in New Mexico, and the CSAV volcanology field camp in Hawaii. After graduating from Mesa State College (now Colorado Mesa University), she had a one-year post-baccalaureate job at Los Alamos National Lab (LANL) working in the Environmental group and Geophysics group. After her year off, she started graduate school at Georgia Tech working with advisor Dr. Josef Dufek. 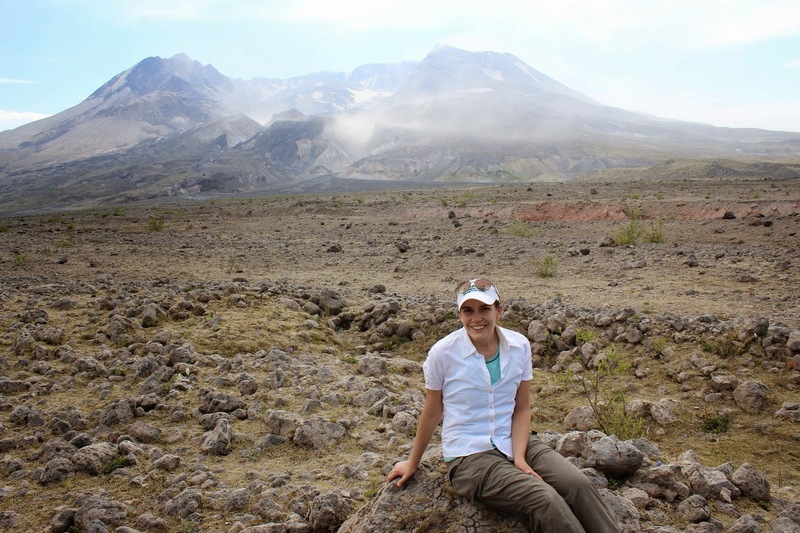 Mary has been fortunate to do field work at Tungurahua and Cotopaxi volcanoes in Ecuador, Mount St. Helens in Washington, USA, and Kos Plateau Tuff, Kos, Greece. Mary also loves to travel and tries to get out of the country once a year, loves to stay active running or hiking, wished she had more time to paint and draw, has a Little Sister from Big Brothers Big Sister of Atlanta, and is very blessed with amazing friends and family. This Spring we will be offering a Field Method in Volcanic Terrains course in Greece. Igneous rocks comprise the bulk of our crust on Earth and the other terrestrial planets, and volcanic eruptive processes shape the surface morphology and provide a link between solid earth and atmospheric processes. Our understanding of these processes has been transformed by the careful study of classic field localities. This course will give students the hands on experience of interpreting past environments using the natural laboratory of the eastern Aegean (Kos and Santorini). Working in groups students will design research projects and will receive an introduction to the magmatic environment of the Aegean Arc. We will particularly emphasize the types of knowledge that can be garnered from different scale observations in the field, and will use several features that can be observed remotely and on the ground to serve as analogues for the interpretation of processes on other planets. This course will be particularly useful for those interested in the structure of the crust, reconstructing past environments from field studies, planetary studies, and volcanology. One of the interesting topics the lab has been pursuing in the last couple of years is trying to gain a better understanding of the total atmospheric pressure on Mars. This obviously has implications for the potential stability of water on Mars surface, but also has a few important links to volcanology. Magmas ascending to the surface degas and provide a source of volatiles (e.g. water, carbon dioxide) to the atmosphere. Likewise the nature of the atmosphere can drastically alter the dynamics of eruptions. Recently we conducted a series of experiments aimed at explaining one of the features observed by the rover Spirit at Home Plate and use it to constrain atmospheric pressure. This feature is a package of deformed sediments below a larger block of rock that has been interpreted as a bomb sag. On Earth, bomb sags are generated in explosive eruptions (often produced by magma-water interaction). During this sort of eruption base surges or pyroclastic flows are generated that accumulated deposits surrounding the blast region. Periodically larger chunks of rock (referred to as bombs) are ejected and follow near ballistic trajectories. They impact the accumulating deposit, deforming it, and leaving the impactor in place. This is then often covered by further accumulating deposits (see attached pictures and video). Inferred bomb sag on Mars. Courtesy: NASA/JPL. The impact velocity of the bomb or clast is strongly controlled by the atmospheric density. A more diffuse atmosphere will lead to larger impact energies. By calibrating the impact energy required to produce a certain size bomb sag we can then deduce near surface atmospheric density and pressure if we hold other factors constant (things like gravity and size of the clast). With a ‘pumice-gun’ we were able to propel clasts in a controlled laboratory setting at sediment targets to do precisely this. (The pumice-gun propels the rocks using compressed gases --- the concept is probably familiar to all who have built a potato-gun). Two important results came from this series of experiments. The first is that the energies implied to make the bomb sag at the Home Plate location requires atmospheric densities greater than 0.4 kg/m3 (roughly 20 times greater than mean present atmospheric density). Also to produce the continuous deformation of lower layers during the impact (which is diagnostic of a bomb sag) the sediment has to be saturated in water. This water can come from nearby environmental sources or from the explosion source as recondensed steam. To learn more about these experiments see the associated video and release, and you can also look at some of the coverage of the Geophysical Research Letters manuscript. Michoacán, México – 1953. Remigio Rita Morales and his friends stopped their afternoon game of marbles and looked up into the sky. The young P'urhépecha boys felt the ground shutter as jets of dark clouds engulfed the winter sky. Standing, the Remigio saw that the boiling gases and ash emanated from a large gash in a nearby corn field. Around the aperture, the surface moved up and down with every new explosion. The blasts echoed off the surrounding mountains—off Tacintaro, off Equijuata, off Tzirapan. On Feburary 20th, a few weeks after the P'urhépecha celebration of the New Fire (new year), a volcano was born. The new mountain was named Parhíkutini, the Place on the Other Side. The eruption was long; it lasted more than 9 years. Thick lava flows oozing out from two vents destroyed the town of San Juan Parangaricutiro, covering everything except for the steeples of an unfinished church. Only three people were killed in the eruption of Parhíkutini. However, it was not the sluggishly-flowing rivers of molten rock that claimed these lives (the lavas from Parhíkutini are so viscous once could easily outrun them). Death came from the skies; these unfortunate individuals were stuck down by powerful electric discharges resulting from accumulated charges in the volcano's eruptive column . Volcano lightning. USGS Photograph of volcanic lightning. 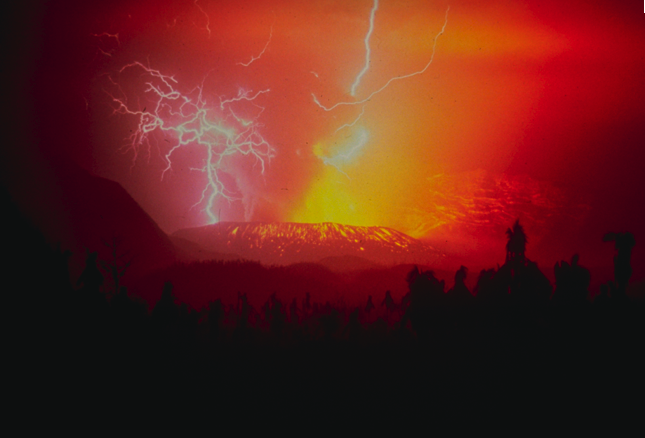 A number of other accounts regarding volcanic lightning can be found throughout human history. Modern photography has allowed us to capture dazzling images of intricate electrical discharges enveloping clouds of hot ash and gas. However, other than of a purely observational nature, this phenomenon has received relatively little scientific attention. Electric discharges, both natural and man-made, result when two regions accumulate huge amounts opposite polarity charges. In a typical thunderstorm, for example, positive and negative charges exists at different heights within the thundercloud. These spatially separated charged regions forms an electric field within the cloud. The magnitude of the field, commonly expressed in volts per meter (V/m), is proportional to the charge density in each region. Now, we must remember that nature likes to minimize the energy of a system. As such, the electric field will try to bring opposite charges toward each other in order to neutralize them. Given that air is a relatively good insulator (meaning it does conduct electricity very well) electrical fields smaller than 100,000 V/m will have a difficult time moving charge carriers around. However, larger pockets of charge will produce fields that will exceed the electrical breakdown value for air producing a massive, rapid flow of charge particles or a current. This is how you get a lightning strike . The previous description of an electrical discharge holds true for volcanic lightning, however the mechanisms that produce the separation of charge within an eruptive column may be quite different from those within thunderclouds. Indeed, the physics behind the charging of ash particles is relatively unconstrained. While we by no means have a complete picture, we do have a number of clues that allow us to draw a rough sketch of the processes that cause eruptive columns become charged and eventually produce lightning. For example, we know that when small particles, like ash or sand, collide and rub against each other they can acquire a net charge. This charging by rubbing is commonly known as the triboelectric effect. Indeed, in industrial settings where powders are moved around quite a bit, the triboelectric effect can be so powerful that it can produce sparks and explosions in the vicinity of combustible materials. As such, a number of researchers have devoted great effort to try to understand what produces triboelectric charging at the microscopic scale and how negative effects can be mitigated  . To test whether the triboelectric effect plays an important role in the charging of ash particles, Josh Méndez and Dan Arrington are conducting experiments using ash samples from three active volcanoes: Mount St. Helens (Washington, USA), Tungurahua (Tungurahua, Ecuador), Parhíkutini (Michoacán, México). By using material from different volcanoes will explore how magma composition affects the magnitude of triboelectric charging. Mt. Saint Helens and Tungurahua have medium silica contents with subduction related input, typical of large stratovolcanoes. Parhíkutini, on the other hand, is a cinder cone volcano which produced magmas from a mantle source, with little subduction input and lower silica content . To cause particles to collide we have developed an experimental apparatus similar to that used by Forward et al (2009) to explore triboelectric charging in other materials. The apparatus allows us to fluidize a certain quantity of and measure the resulting charge accumulated on the particles. Additionally, we are exploring how fast particles charge. At the time this blog entry was posted, experiments were currently underway and results were being prepared for the 2012 American Geophysical Union meeting. So, why understand volcanic lighting? The answer is simple: lightning can be detected from great (and safe) distances. By understanding the relationship between ash movements, chemistry, and lighting we may be able to probe the interior dynamics of an erupting volcano in a risk-fashion. Such a tool would indubitably be beneficial for hazard assessment, ash dispersal forecasts, in addition to gaining a better understanding of the global atmospheric electrical circuit. This blog describes the research activities of lab group members in multiphase flow and volcanology. Lab group members include Joe Dufek, Jenn Telling, Mary Benage, Joe Estep, Ozge Karakas, Cindy Young, Josh Mendez, and Domenico Doronzo.